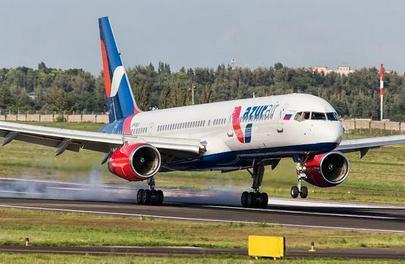 Russian charter carrier Azur Air will start operating regular flights within this year’s summer schedule. Having received Russian aviation authorities’ permission to fly to Thailand and Spain, Azur Air will operate one weekly flight from Moscow to Bangkok and three flights to Barcelona from Rostov and Krasnodar per week. Earlier, the airline had these destinations in its charter program, Azur Air’s spokesperson explained to Russian Aviation Insider. Its decision to operate regular flights is based on the travel industry’s trend to include air travel with tour packages. Part of the capacity will be reserved for travel agencies, whereas the rest of the seats will be sold through conventional distribution channels, which will enable the airline to cater to both groups of travelers: those that use agencies’ services and those that make their own arrangements. The airline is considering expanding its regular network. After air travel to popular tourist destinations in Egypt and Turkey was banned, Azur Air expanded its service offering to Thailand. It is also increasing the number of destinations in Spain. There are plans to launch charter flights to Malaga, Reus, Palma-de-Mallorca and Tenerife. Apart from the regular flights, Azur Air obtained the Federal Air Transport Agency’s approval to operate charters to Bulgaria, Dominican Republic and Spain.